The newest cohort in the Doctorate of Business Administration (DBA) is now in place with classmates from Webster Geneva. Program director Fernando Lagrana gave an excellent presentation to welcome the new cohort on Monday, Nov. 23, at their first workshop held in Grenoble, France. The program is a collaboration between Webster Geneva and Grenoble Ecole de Management, which offers the DBA. The first workshop is combined with a U.S.A cohort and held for a week in Grenoble, France. This year’s cohort represents 10 different nationalities among the 12 students, whose countries include Germany, India, Indonesia, United Arab Emirates, Italy, France, Switzerland, Bulgaria, Finland and the United States via Nigeria. 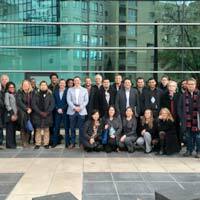 They will meet again for their next five workshops on the Webster University Geneva campus. This DBA is research-based, issue-driven qualification that culminates in a doctoral degree. It focuses on the broad area of the management of technology, organizational change and innovation. The Grenoble DBA collaboration with Webster Geneva is specifically designed to be completed while continuing to work full-time. It holds a triple accreditation; AMBA, AACSB & EQUIS. It is not necessary to live in Geneva or Grenoble as much of the study can be done wherever a student is in the world. With five of the seven workshops in Geneva, students can study for their DBA in Switzerland while benefiting from a rich multicultural exchange. More information about the DBA collaboration can be found here: www.webster.ch/dba.